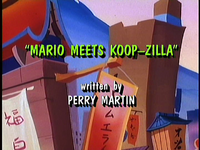 "Mario Meets Koop-zilla" is the twenty-eighth episode of The Super Mario Bros. Super Show!. Its corresponding live-action segment is "Fortune Teller". 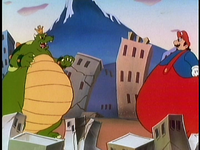 Mario and King Koopa fight as giants. In the oriental city of Sayonara, Mario, Toad, Princess Toadstool and Luigi, who is pulling the cart Mario, Toad and Princess Toadstool are riding, are searching for a weapon that can help them defeat King Koopa, Super Sushi. Asking Princess Toadstool what’s so special about Super Sushi, Toad is informed by her that, once Super Sushi is eaten, it will cause the eater to grow two times larger and more powerful; Toad is also told by Mario that Super Sushi makes excellent spaghetti sauce, who proceeds to tell Luigi to go faster. As Luigi becomes somewhat irritated by Mario's demands, the ground begins to shake sending him, Mario, Toad and Princess Toadstool into the air and then on to the ground. Noticing various people fleeing in panic, Mario, Luigi, Toad and Princess Toadstool begin to wonder what’s going on, only to notice King Koopa, who has grown gigantic in size, stomping towards them. Rampaging through Sayonara, King Koopa begins to chase after Mario, Luigi, Toad and Princess Toadstool, destroying their cart as well. As he runs, Luigi begins to wonder how King Koopa got so large in size, a question which Mario answers by saying that the only person who can tell them is the inventor of Super Sushi. Having reached a building with a satellite on it, Mario, Luigi, Toad and Princess Toadstool meet Dr. T. Garden, the inventor of Super Sushi, in it. After Princess Toadstool states to Dr. T. Garden that it is an honor to meet him, Dr. T. Garden states that it is an honor to meet Mario and Luigi, two of the world's greatest plumbers; after accidentally hitting his head against Mario's when the two bow to one another, Dr. T Garden is asked by Princess Toadstool how he believes King Koopa attained his gigantic size. To answer Princess Toadstool's question, Dr. T Garden decides to show her, Mario, Luigi and Toad footage of how King Koopa became colossal on his laboratory camera. A nearby television screen lowers from the ceiling and displays a video of Dr. T Garden finishing another batch of Super Sushi, wishing he claims to be his most powerful yet. As Dr. T. Garden admires his work, King Koopa barges into his laboratory and demands Dr. T. Garden give him his Super Sushi, before trying to wrestle the platter of Super Sushi from him. After a brief fight, King Koopa manages to knock Dr. T. Garden to the ground and begins to messily devour the Super Sushi, flinging food everywhere and disgusting the observing Toad, who refers to King Koopa as a pig due to his eating habits. Finishing off what remains of the Super Sushi with a lick to the platter, King Koopa is told by Dr. T. Garden that he ate to much of the Super Sushi and will grow too much; laughing at Dr. T. Garden, King Koopa tells him that that was his plan all along before suddenly growing so huge he bursts through the roof of Dr. T. Garden's laboratory roof. The final scenes of Dr. T. Garden's video displays King Koopa proceeding to rampage through Sayonara after rechristening himself Koopzilla. Turning off his recording of how Koopzilla came to be, Dr. T. Garden admits to Mario, Luigi, Toad and Princess Toadstool that it was his fault that Koopzilla is now destroying Sayonara; after Dr. T. Garden sadly states this, Princess Toadstool tells Mario that he can't allow Koopzilla to cause anymore damage. Outside, as people flee from him, Koopzilla grabs a parked car and proceeds to start eating it, only to be attacked by a pair of missile firing planes. Annoyed by the assaulting planes, Koopzilla simply swats at them, causing them to crash and the pilots of them ton evacuate using parachutes. Watching as the planes explode some distance away, Koopzilla is attacked by an armada of tanks, which begin blasting him; Koopzilla swiftly defeats these tanks by simply blowing them away, and promptly laments afterwards that destroying a city can be hard work. Nearby, Luigi, who is driving a motorcycle Mario is on as well, tells Mario that he hopes his crazy plans works; Mario responds to Luigi's worries by saying that his crazy plans always work and that all they need to do is find Koopzilla, whose roar Mario hears just after exclaiming this. Grabbing a water tower, Koopzilla begins to drink the water in it while saying that all the destruction he has been causing has worked up his appetite. After saying this, Koopzilla begins eating a radio tower he had been holding; as Koopzilla eats, Mario and Luigi drive up to and park near his feet and Mario, using a megaphone, begins to taunt and threaten Koopzilla; becoming enraged by Mario's jeers towards him, Koopzilla tries to crush him with his foot, only to miss when Mario and Luigi drive away. As Koopzilla chases him and Luigi, Mario says that their plan has worked. Up ahead, Toad has just finished preparing a trap for Koopzilla, consisting of a gigantic net to be dropped on him; as Toad finishes some last minute adjusting on the net release, Princess Toadstool tells him that he finished setting the net up just in time, as Koopzilla is approaching. Managing to lure Koopzilla to the exact position under the net, Mario has Luigi stop the motorcycle so he can get off, which he does to alert Toad to drop the net. Hearing Mario, Toad releases the net, which falls on Koopzilla, surprising him and knocking him over. Struggling to escape from the net, Koopzilla begins to threaten Mario, only to be informed by him the net he is trapped in is made of solid steel and unbreakable. Koopzilla proves this assumption of Mario's wrong when he, after a lot of struggling, manages to break the net confining him; as Princess Toadstool and Toad flee after telling Mario and Luigi to run themselves, Koopzilla begin to resume chasing Mario and Luigi, who frantically try to escape him on their motorcycle. As Koopzilla tells Mario and Luigi to stop moving, Luigi asks Mario how they will escape the pursuing Koopzilla; responding to Luigi's question, Mario has him stop and jump into a manhole ahead of them, which Princess Toadstool and Toad are in. Seeing Mario, Luigi, Toad and Princess Toadstool duck into the manhole, Koopzilla sticks his arm into and begins trying to grab one of them. With Koopzilla's hand trying to grab them, Mario grabs a pipe out of the wall. Using this pipe, the end of which is broken and pointed, Mario jabs one of Koopzilla's fingers with it, causing Koopzilla to yell in pain and leap through the air, landing nearby. His finger having become swollen and red, Koopzilla, enraged, decides to ignore Mario, Luigi, Toad and Princess Toadstool for the time being and go back to destroying Sayonara. At Dr. T. Garden's laboratory, Dr. T. Garden has just finished another batch of Super Sushi for Mario to eat. Giving the Super Sushi to Mario, who hastily eats it with spaghetti, Dr. T. Garden, Luigi, Toad and Princess Toadstool watch as he grows gigantic, destroying Dr. T. Garden's building in the process, much to his chagrin. Elsewhere in Sayonara, Koopzilla is tearing a building apart when he notices Mario leap towards him. Seeing that Mario has become as large as he is, Koopzilla begins to grapple with him; after some fighting, Mario manages to toss Koopzilla over his shoulder and into a nearby building. Before Koopzilla can get up, Mario grabs his tail and begins swinging him around before tossing him into a pile of collapsed buildings. As Mario taunts him, Koopzilla gets up and grabs a pair of telephone poles to be used as weapons. As Koopzilla approaches him, Mario grabs a train and begins using it as a weapon. As Mario and Koopzilla's battle intensifies, Toad, who is in Dr. T. Garden's shoddily rebuilt laboratory, states with some irony that if the battle continues, Mario may save the city, but there will be no city left. After Toad exclaims this, Dr. T. Garden unveils to him, Luigi and Princess Toadstool that he has created an antidote to the Super Sushi, which can be used to shrink Koopzilla. As Mario and Koopzilla fight, Princess Toadstool, Luigi and Toad approach with a large needle filled with Super Sushi Shrinker. After dodging a billboard tossed at him by Koopzilla, Mario lands in front of him and manages to somehow pull the street out from under Koopzilla's feet like a rug, knocking Koopzilla to the ground. Getting up, Koopzilla begins to charge towards Mario, only to be jabbed in the ankle by Luigi, Toad and Princess Toadstool's Super Sushi Shrinker filled needle. Having shrunk to his original size, Koopzilla, enraged, uses a Magical Potion to open a portal to a Warp Zone, which he leaps into. Glad that Koopzilla is gone, Princess Toadstool, Luigi, Toad and Mario, who has returned to normal (off-screen), return to Dr. T. Garden's laboratory, where Dr. T. Garden thanks them for saving Sayonara. Having become hungry from fighting Koopzilla, Mario, while looking through some containers in Dr. T. Garden's laboratory, finds a large pill and eats, only to be informed by Dr. T. Garden that the pill was his newest invention, Shrinking Sukiyaki. After eating the Shrinking Sukiyaki, Mario shrinks to minuscule size and, panicking, asks Dr. T. Garden to give him the antidote, only to be told by him that there is no antidote and that he will have to wait a week for the effects of the Shrinking Sukiyaki to wear off. Unhappy with this, Mario decides that as long as he is this size, he could at least eat his own weight in pasta as Luigi, Toad, Professor, and Princess Toadstool laugh. When Mario is mixing his spaghetti with the Super Sushi, he is holding a fork but it suddenly turns into a spoon when he starts to eat. In the same shot, the bib and the "M" on his cap disappear. The number of fingers on Dr. Garden's hands change in certain shots. In his first appearance, he has the traditional cartoon three fingers and a thumb. At the end, he has four fingers and a thumb like a real human. When Mario ducks from the red building that Koop-Zilla throws at him, it appears to be a lighter red. Koop-zilla's size as a giant is inconsistent, as at first his foot is as tall as a building, but later he is merely the size of a factory. It is unknown how Dr. Garden's lab is rebuilt so quickly during the events of Koop-zilla's rampage. It is also strange how the hidden laboratory cameras were still functioning albeit Koop-zilla tearing the laboratory down as he escaped. Although King Koopa has a snake-like tongue on account of being a reptile, he has a human tongue when he licks the plate of Super Sushi. The car Koop-zilla munches on lacks detail when he picks it up. The yellow warplane headed for Koop-zilla has a blue nose (the front part of the plane) at first, but gains a yellow nose (just like the rest of it's paintwork) when the camera zooms in, and turns blue again as the plane dives down. The net that entangles Koop-zilla is much larger than when Princess Toadstool and Toad were creating the trapping mechanism. The manhole is also much larger than usual when Koop'zilla attempts to grasp Mario, Luigi, Princess Toadstool, and Toad from the sewers. If one looks very closely at Koop-zilla's foot as he stops after the commercial break, there is no leg at the base of the ankle. Albeit Koop-zilla squashing Mario and Luigi's motorcycle, it is still shown to be intact when the gang emerges from the manhole. Also in that same scene, Luigi's eyes are inexplicably half-open at the end. The second Super Sushi is repositioned differently when taken out of the microwave. It is unknown how Luigi, Princess Toadstool, Toad, Dr. Garden, and the other (presumably) laboratory workers survived the lab crumbling as the enlarged Mario makes his way out. The train that Mario uses as nunchucks lacks detail when Koop-zilla corners Mario at a building, and regains detail when Mario charges at him. After Luigi injects the Super Sushi Shrinker serum into Koop-zilla's foot, the hypodermic needle vanishes for the remainder of the scene. Official summaries for "Mario Meets Koop-zilla" lack the hyphen in the name. The scene in which Mario grabs Koopzilla's tail and swings him around before throwing him is reminiscent of the Bowser battles in Super Mario 64, which had Mario doing the same thing, though predated by seven years (Super Mario 64 is a 1996 game). King Kong and Mechagodzilla III have done similar things to Godzilla. This is the first time one of the commercial bumpers says "Mama-mia! It's a Super Mario Brothers cartoon!" This page was last edited on March 2, 2019, at 15:28.